Stem: Cannondale C1 6061 Alloy 1.5 31.8 -5 deg. To create the fastest XC race rocket the world has ever seen, innovation is not an option, it's a necessity. Using our System Integration approach, every part of the new F-Si - from the asymmetrically offset rear triangle and drivetrain, to the new-school geometry and custom rake Lefty - was designed as a system, fully integrated in the pure pursuit of speed. Our Ai design shifts the drivetrain and rear triangle to the right by 6mm. This creates an ultra stiff rear wheel by reducing dish, and delivers the shortest chainstays on the market, dual chainring compatibility, tons of mud clearance, and a super responsive rear end. 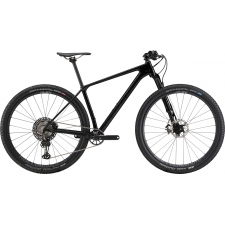 By keeping the rim and tire in line with the centerline of the bike, but shifting the hub and cogs 6mm to the right, we make the spoke angles more even on both sides, creating a stronger wheel that's up to 60% stiffer than a conventionally laced wheel, while using a standard rim and normal 135mm hub. The Ai system allows for the shortest chainstays on the market (429mm), which moves the rear wheel forward to be more under the rider, resulting in exceptional lateral stifness and racewinning traction. The F-Si spider moves the chainrings out 6mm to match the rear triangle with no change in Q-factor. This enables the super short chainstays while providing ample mud clearance for the tire and maintaining double and single ring compatibility. Up front, the progressively slack 69.5deg head angle gives the stability needed to attack on rough, fast descents, while the Lefty features increased fork offsets (55mm for 29 and 50mm for 27.5 ) to reduce "trail" and keep the steering quick and nimble in slower, tight, technical sections. In back, the super short chainstays make the bike extremely agile for technical manuverability and crazy traction. Our proprietary carbon construction method pairs ultra strong military armoring fibers with high strength resins and a tightly controlled network of high-modulus stiffening fibers to deliver ultra light frames with exceptional strength and ride-feel. Oh yeah, and lifetime warranties. 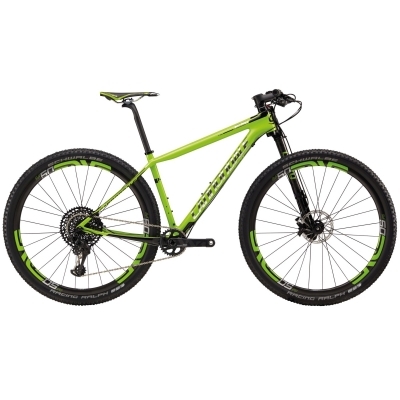 Buy your Cannondale FSi Hi-Mod Carbon Team Mountain Bike 2018 from Revel Outdoors.